We got back on the trail on Tuesday afternoon and it is now Saturday and we’re in town. What I’ve thought about most of the time during the past five days has been my family and especially Zoe and Ashleigh. Every day I would think back to what went on a week ago and what we were doing at that moment and well, it was a tough five days to walk. I can’t help it. It’s not just Zoe, but I miss everyone. It was really effing hard the second day back on the trail. Yesterday was the first day I felt “trail normal” again, but I don’t know how long that will last. I was bummed that I didn’t get to upload photos from our zoo adventure last Monday but I saw my SIL Stephanie uploaded them to Flickr so I nabbed this one. 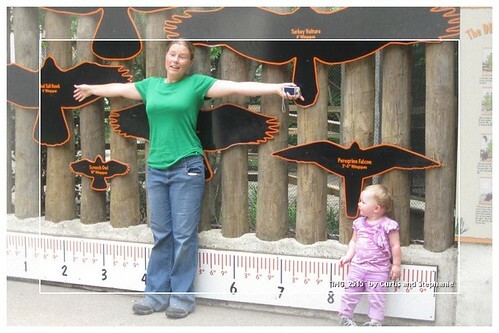 I just couldn’t Zoe to open her arms wide enough to see what her wingspan would be. She was kinda confused! Anyway, we’re in town and I will post again later today, hopefully with some photos. We made it down Dragons Tooth, up McAfee Knob and across the Tinker Cliffs. We’re incredibly sore from 5 days off and I am enjoying rashes under my arms from a wet tank top rubbing against my pack and then rashes on my heels from wet socks. Don’t ask me why I didn’t get blisters but got blessed with rashes instead. Hrmph. It is feeling more and more like summer. Well the days here are just as hard. Minus the rashes thank goodness.